Wayne Lynch "2008 Surf Pioneer"
Wayne Lynch was often viewed as a “soul surfer” but could just as easily be known for his performances in the competition singlet. 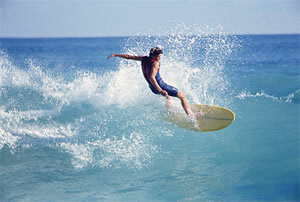 A dynamic Australian goofyfoot, Lynch was a major frontrunner in the shortboard revolution. While most guys during the late ’60s and early ’70s were walking to the nose on 10-foot surfboards, Lynch was riding seven-foot boards and turning up and down the face. Nat Young and Ted Spencer, it is most notably remembered for Lynch’s surfing. After being bedridden due to a motorcycle accident for nearly six months, Lynch returned to the water in 1974 where he continued to compete part-time for the next three years. Lynch continues to live a quiet life in Australia, shaping surfboards as he has since the early ’70s. He is married and has two children.